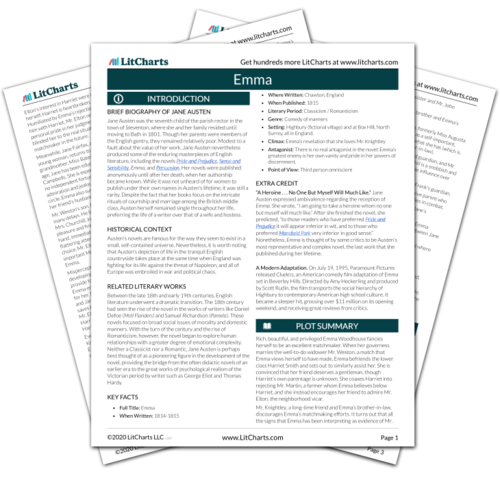 Instant downloads of all 945 LitChart PDFs (including Emma). Favorable gossip circulates in the town about Miss Hawkins, Mr. Elton’s fiancée. Mr. Elton, having left greatly offended, returns to town especially delighted to spread reports of his beautiful, accomplished, and amiable bride with an independent fortune. Mr. Elton’s pride is apparent as he quickly moves from Emma to Miss Hawkins. His boasting in this second, swift success reveals his shallow sentiment and lack of grace. Emma finds Mr. Elton even less agreeable than before with his airs of pretension, but she is grateful that his marriage will relieve the tension in their relations. She is pleased to find his bride no more well connected, though wealthier, than Harriet, in spite of Mr. Elton’s disdain and self-importance. Ironically, much of the snobbery that Emma finds distasteful and unfair in Mr. Elton’s assessment of Harriet applies to Emma’s own proud devaluation of Miss Hawkins and the Martins. Harriet’s preoccupation with Mr. Elton continues, only to be distracted by a courteous visit from Mr. Martin’s sister. Emma encourages Harriet to return the visit out of civility, though she ensures that Harriet will not stay too long and re-establish intimacy with the Martins by dropping her off and picking her up. Despite Emma’s belief that Harriet’s nature is too shallow to love deeply, Harriet demonstrates a steadfast if silly attachment. Emma continues to control Harriet’s affairs, believing her own judgment to be superior to her friend’s. Tam, Stephanie. "Emma Chapter 22." LitCharts. LitCharts LLC, 2 Oct 2013. Web. 16 Apr 2019. Tam, Stephanie. "Emma Chapter 22." LitCharts LLC, October 2, 2013. Retrieved April 16, 2019. https://www.litcharts.com/lit/emma/chapter-22.